Take Your Playing to the Limit! with our Acoustic and Resophonic Guitars, Flat Top and Carved Top “A” style Mandolins. Now introducing Electric 5 String Banjos and Tele-style Electric Guitars! Ferrell Stowe has been a hero in the resophonic guitar community for some time. 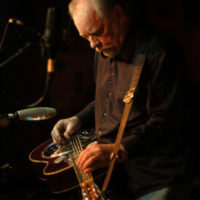 Top current players credit him as an influence, and his long list of credits as both a sideman and a solo recording artist have added mightily to the catalog of dobro music in bluegrass. Recordings featuring his slide work go back to the mid-’70s when we was with The Shady Grove Ramblers, and have continued to the present day with a more recent project with Cedar Hill, and a series of solo projects under his own name in the past 15 years. Presenting "The Stowe", a new resophonic guitar model built specifically to the specifications and in honor of the great Ferrell Stowe.